Giveaway - CowRC Udder Butter, to two lucky winners! COW RC Udder Butter from CowRC.com! 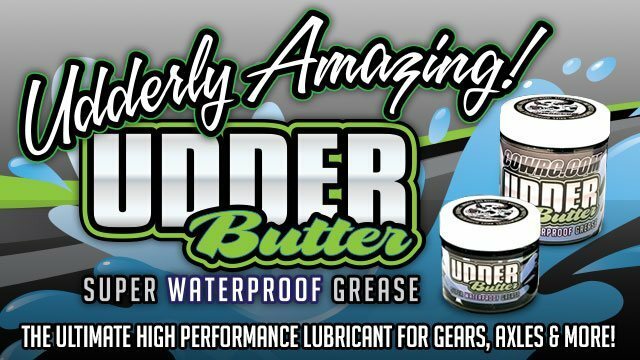 CowRC Udder Butter provides superior water resistance, even in salt water, will ensure continued sealing and protection. Perfect for wheel bearings, shock linkages, swing arm pivots, transmission, axles, differentials and more! Enhanced mechanical stability and special anti-wear additives protect and lubricate. Mineral oil based & aluminum complex formula that will not melt or run out provides maximum protection against wear, rust, corrosion, and friction. TWO Winners will be randomly picked on Oct 30h @ 1:00PM EST. Good luck! Ha! Had to check how many posts i've made to see if I could enter! Thanks for the giveaway Woodie! thanks for another great giveaway! I'm in! I can't believe it's udder butter........ Thanks for the opportunity. My avatar's messed up, but at least I'm in the running for the giveaway! Well I'm not first but I'm in for some Udder butter. Nice...I could definitely use this when I get my bearings. I will put in for another day. the international dibbs protocol doesn't work here. Hey hey it's another day. Bashin time. A new day and another post. Saying hey for another chance. thanks for another sweet contest.